With many thanks to Steve Pake, who originally wrote this post on his website. This story is the story of Steve Pake. This is the story of my 4 year long fight to reclaim my body after cancer, from barely being able to walk unassisted and having so many complications, setbacks, and headwinds, to finally punching through and running 30 minute 5Ks, and all that I’ve learned along the way. I’m a 4 year survivor of testicular cancer, who to this day still has daily struggles with muscle fatigue and weakness, and other symptoms of chemotherapy-induced peripheral neuropathy that have become permanent. I took up running as a way to push back hard against this. For years I couldn’t run more than a few blocks at a time no matter how hard I tried, but I persisted, and today I’m able to run regular 30 minute 5K’s. This is my running story, and the story of my physical recovery after cancer! For years after my cancer fight, I would struggle with my body physically. Prior to cancer, I could wake up at six in the morning and be into work by seven, work straight through lunch and be home by four, work out hard for an hour, pickup my kids by five, run around and play with them all night and go to bed by 11 or 12, and then wake up no problem the next morning and do the same thing all over again. I was invincible. I had unlimited amounts of energy, and my body could do whatever I wanted, whenever I wanted, even on very little sleep. But after cancer, those days were long gone. Four rounds of chemotherapy knocked me down hard, and then the RPLND surgery knocked me down even harder. After cancer I would struggle to even get out of bed by seven, and would be plagued with fatigue issues throughout the day. Even simple motions and movements would feel strained, as if I had just lifted a ton of weights. And rather than being able to stay up until midnight every night if I wanted to before, now I would be dead tired as soon as I came home from work, and crashing hard at only 9pm. I had been in nearly the best shape of my life before cancer, but would find myself in the worst shape of my life after. I started a new job just weeks after my cancer fight had come to an end, and my new co-workers were greeted by a ghostly pale fellow with just fuzz for hair who could barely stand up straight, walk down the hall or balance himself without holding onto something, nor make it up a flight of stairs without wheezing for breathe. And then, things just got worse when I developed terrible shooting nerve pain that I would suffer from for hours out of the day. I couldn’t sit still for any length of time without it flaring up, and co-workers would be startled when I would suddenly double over in extreme pain. And then I found out that one of my kidneys was near failure. A lymphocele from my RPLND surgery had formed directly adjacent to and was pressing up against the ureter of my left kidney, almost completely blocking it and causing hydronephrosis. I was experiencing organ failure, which also explained why my creatinine numbers had shot straight through the roof. Lovely! When a fine needle aspiration and alcohol schlerosis procedure didn’t resolve it, I ended up having to get an incredibly painful and uncomfortable kidney stent placed for about six months, which made it difficult and uncomfortable to even move at all. I felt like I was going backwards. I was happy just to be alive, but my physical experience was one of constant struggle, and my quality of life wasn’t anywhere close to being what one would call good. Many of the struggles I faced with my body were due to chemo-induced peripheral neuropathy (CIPN). Platinum-based chemotherapy agents melt away testicular cancer tumors, but are notorious for causing nerve damage and all sorts of other damage throughout the body. There wasn’t a single day that I woke up after my cancer fight feeling like I had anything more than a half tank of fuel for the whole day. I was constantly tired and felt weak, had burning and tingling sensations in my arms and hands, had numbness issues and could barely feel my feet, in addition to pain issues and problems with reflexes and balance. Doctors told me that these symptoms would improve to as good as they would get by a year after treatments had ended, and so I just endured all of this for a year. But that year came and went and then some, and by the end of 2012 my body was far from “bouncing back.” It was stumbling and face-planting more than anything, and far short of a full recovery. My heart sank when it became clear that many of my physical struggles were likely to become permanent issues, and I became incredibly distressed. Here I was, a young guy just into my mid-thirties with so much of my life in front of me, and two young kids and a busy family to keep up with, yet I was still struggling so much physically and in tremendous amounts of pain every single day. These were supposed to be the prime years of my life, yet in so many ways I felt like a decrepit old man. I never stopped being happy that I was alive, but this was neither the life that I expected nor that I wanted after cancer, and my quality of life just wasn’t there. I didn’t know what to do anymore. Nothing brought me more happiness and joy than my family, but every year my kids would be getting a little bigger and a little faster, and I feared one day they would just leave their “old man” dad behind, who could never go anywhere or do anything too strenuous, because of all of his issues. I had beaten the damned cancer, but felt like it was still getting the last laugh in some cruel way, and I hated every bit of this. My awesome kids have always been my top priority. I was terrified that one day they’d just leave their decrepit “old man” dad behind. I had more than a few friends that were into running, including many cancer survivor friends that I had only just met in the past few years. I had even run a bit myself many years ago but had given it up, but now found myself incredibly inspired by all of my survivor friends’ fundraising efforts for various cancer charities, and how hard they worked. I had been walking for general exercise which helped a lot, but thought maybe I needed to push myself harder, and so I decided to give running a try again. As to be expected, I couldn’t run very far or very fast at first and just ran whatever segments on my walking route that I could. All it took is a little bit of running for something incredible to happen, though! The next evening, the first full day after this first run, I was settling into bed for the night and about to drift off to sleep when suddenly I bolted upright, wide awake and in shock! My God, I told my wife, I hadn’t had any nerve pain that day! I hadn’t had any throughout the day, and the 20-30 minutes of thrashing nerve pain and muscle twitching that I typically had to endure my way through before falling asleep each night didn’t happen either. It hadn’t gone unnoticed by my wife, either. This was just as painful and disheartening for her to watch as it was for me to experience! When there’s so much love there’s also transference, and it’s like every stabbing shot of extreme nerve pain was hurting her also, and she felt powerless to do anything about it. We were both speechless! There was something about the intensity and impact of running that literally gave my nervous system a good workout, and that also seemed to calm it down. I had been on godawful drugs like Lyrica before, which did help reduce my nerve pain issues, but not without making me feel like I had been hit by a bus. My wife begged and pleaded with me to take it because of how painful my nerve pain episodes were for her to even watch night after night, but I had sworn pills off entirely. Every single pill I ever took always seemed to have more side-effects than the relief they provided, and just seemed to make things worse! If simply running was all it would take for me to finally live a pain free life, without any rotten pills and their nasty side-effects, then by God I was going to do it! I was instantly hooked on running. It didn’t take too much running to realize other physical benefits as well. I had also been suffering from occasional periods of low testosterone, and my hormonal levels in general just seemed to be swinging all over the place. I wasn’t a consistent person anymore in terms of mood. The stress of cancer survivorship no doubt had something to do with that, but swinging hormones did too! When I’d have a testosterone level dropout, it brought with it very depressive moods, and bouts of feeling just completely miserable, directionless, highly irritable, and asexual that could last days if not weeks. If I woke up one morning having had these symptoms the day before, or with the very obvious symptom of not even needing to shave, I would force myself to get out for a run that day no matter how awful I felt. I’d go as hard as I could, and without fail I would always feel much better the next. Just walking had never managed to perform a magic trick like this with my body or my hormones, but running could. Around the time I started running at the tail end of 2012, I was also falling into a very bad place emotionally. A fellow cancer warrior friend had just died of his cancer, and a few others had experienced recurrences of theirs. I had a very bad recurrence scare myself where I thought for sure that my cancer had returned, and that I was going to die. I had been in a complete panic, went to sleep in tears numerous nights, and had the fear of God in me. I had a few extra tests done as a precaution when I went in for my follow-up and everything turned out fine. My body was fine, but the emotional floodgates had opened. Tons of repressed memories and unexpressed fears and emotions from my cancer treatments that I had unknowingly kept bottled up inside of me for nearly two years, suddenly started coming out. I fell into a depression and began experiencing extremely bad post-traumatic stress. I was so afraid, and didn’t know what was real and what wasn’t anymore. I was so charged up with anxiety and adrenaline almost all the time, and it would burn me up inside emotionally sitting still. Running gave me an outlet for all of this pain and energy. When you’re in such a deeply distressed state, there’s something very primal about running specifically, outside and with the wind on your face and not on some wretched treadmill, that just helps to release that energy and bring a sense of calm back. Perhaps most importantly of all, the time I had mapped out in my day for running, typically over my lunch hour, also gave me the time that I needed to help sort out my life again. I realized the need to completely reset and rebuild my life from scratch after cancer, but when would you ever find time to sort life out again like this with a busy job and family? Running wasn’t just exercise for me anymore, pushing back against physical challenges. Running became an important appointment that I needed to keep with my mind, body, and soul. My time for running was the only time of the day where I wouldn’t be dealing with work or family or anything else. It was time just for me, and my time for running quickly became sacred time for me. Just as Stuart Scott described his post-chemo workouts as his private ‘FU cancer’ time, my lunch time runs became my own private FU cancer time as well. All of the anxiety, the pain, and the fear that I had been experiencing, I dumped it all into my runs, pushing myself as hard as I could. I’d commonly sprint the last quarter mile muttering FU cancer under my breathe, and sometimes aloud. I didn’t know who I was nor what I needed anymore after cancer, and running was the time when I would sort all of that out. I never listened to music. I held very deep soul-searching dialogs with myself, and challenged my beliefs and assertions about everything. Slowly but surely I began to understand who and what I really was, what my needs really were as a person, the true origins of so many of my troubles and sources of pain, and also, what I could do about them. As a running mentor of mine had said, “Sometimes, running is the only thing that make sense.” I didn’t understand why or how in the beginning, but indeed, running just made sense. Running was just the release that I needed, and it was something that I could do easily every day, even if I mostly walked and just ran a little. As beneficial as running proved to be for me, it was also incredibly frustrating. I could never run more than a few blocks at a time without it feeling like my entire body had slipped into neutral and just couldn’t go anymore, no matter how much I willed it forward. The few times I really pushed it and forced myself to run through a solid mile if not further, even after many months of trying, I suffered terrible physical breakdowns in the aftermath. My speech slurred, and I could barely walk or lift my arms, and my entire body would feel limp. One breakdown was so bad that I nearly had to call my wife to come pick me up, because I almost couldn’t coordinate walking anymore. When I finally managed to stagger back to my house, I had to have her help me up the stairs and into our bedroom, and there I crashed at 7pm, absolutely spent and completely dead in the water. I still couldn’t move when I came to the next morning, and had to have my wife bring me the bedside commode that I had last used when going through chemotherapy, because I couldn’t even get out of bed to go to the bathroom. I didn’t make it into work until nearly lunchtime that day, and for the next several days I would struggle like I never have before physically. I could barely get in and out of my car, struggled to turn the steering wheel at slower parking lot speeds, and even typing and speaking were challenging. I didn’t know what was going on at first and nearly applied for a handicapped parking permit, but in the grand scheme of things I knew that this wouldn’t have done me very much good anyways, that I was probably pushing myself too hard, and that I needed to manage my body better. I was forced to accept that my body just couldn’t maintain a solid run if my life depended on it. I wasn’t out of breathe, my heart wasn’t beating out of my chest, and my muscles weren’t exploding. I had put my nervous system in distress, and was formally diagnosed with chemotherapy-induced peripheral neuropathy around this time by my primary care physician. Typically, nervous system fatigue would be one of the final stages of fatigue for runners, but instead it was hitting me first and before anything else. My nervous system was clearly my weakest link. It just couldn’t keep up with the rest of me, and I had to learn to accept this and live within its limits. I had set a goal for myself of being able to do a 5K run in 30 minutes or less, which is considered to be a very basic starter goal for runners, but for me it felt so impossible. Friends of mine picked up running and could quickly achieve blistering times well below a 30 minute 5K that I could only dream of, while I had to limit myself to a 50/50 mix of either walking or running on certain segments of the course that I had mapped out through my neighborhood. Typically, I could walk/jog a 5K in 34-36 minutes, but some days I could barely even walk one in 40. The best I could do a 5K run was in 33 minutes and change, but not without these terrible physical breakdowns. I was disheartened by how limited I was, but learned what those limits were, and to stay within them. I had to very carefully budget my amount of physical activity in a given day, balance that against the amount of rest I had gotten the night before, and just be happy that I could do anything at all. In time, I learned very well what I could and couldn’t do in a given day. My quality of life improved tremendously when I was able to find the right balance for myself, but I was still frustrated at feeling so limited, in stark contrast with the practically unlimited energy and strength I had had before cancer. Beyond the frustration of not being able to run well at all, there was the complete misery of the cold winter months. Cold weather never used to bother me, but suddenly after cancer it would bring on tons of aches and pains that I’d never had before. I would feel so stiff, almost like I couldn’t move, and would feel completely lousy all the time. Especially around the winter solstice, it honestly felt like my body just wanted to pack up and hibernate for a few months. Chalk it up to a bit of aging, yet more neuropathy symptoms, or other strange effects from chemotherapy that nobody really understands, but the winter months had become a thoroughly miserable experience for me. Alas, running helped with all of this too! Once again, and without fail, and no matter how awful I was feeling, if I forced myself to get out for a run I would always feel so much better. My aches and pains, my mood, and everything else would improve, and I could actually feel reasonably human so long as I kept running a few times per week. Winter seemed to put sand in my gears, but running helped to keep my wheels greased and my body moving. Not once have I ever actually looked forward to running. It’s how I knew I would feel after running that’s always kept me going, along with the time for prayer, meditation, or sorting out whatever awful thoughts have been running through my head. One doesn’t need to try too hard searching on the Internet to realize how beneficial regular exercise is for not just our bodies, but also our minds. I never stopped running, and I never stopped pushing. I was happy to be living pain free, and to have far better quality of life than I did before, and without needing any stupid pills. I was content with the incremental gains in strength and stamina I had managed to pickup, and was accepting that that’s all there might ever be. Time for running was sacred to me and far beyond achieving any particular time, but I still wanted that 30 minute 5K. In an aft corner of my mind somewhere, not being able to get anywhere close to that still frustrated me. It’s not like I was demanding that my body carry me through a half or even a full marathon at the blistering paces some of my friends were putting down. It was just a 30 minute 5K, and not being able to get close to this was a thorn in my side. I would walk or run a total of over 300 miles per year in both 2013 and 2014, and not one of those miles were easy. I had to push myself hard and fight with my body through every single last one of them. But suddenly in 2015, everything changed. I had given myself a break from running in any real quantity from the end of 2014 and through the first few months of 2015 due to an injury, and mostly just walked. My first real run of 2015 came not because I felt my body was ready yet, but rather because of post-traumatic stress. As I rolled into work on Monday, March 16th, all of a sudden I started having terribly nervous and anxious feelings. I’d felt something building through the weekend, and couldn’t think or concentrate at all. Right as I was wondering what in the hell I was being spooked by, I started having visual flashbacks of going through chemotherapy, complete with the smells, the sounds, and the awful feelings. It turned out that that day was the day that I would have been starting chemotherapy four years ago. I hadn’t given this milestone even a single conscious thought, but here my mind was recalling it. It’s like my sub-conscious was remembering, and was spooked fearing that we might be going back. I’d been through ordeals like this more than a few times, and knew that today was just going to be one of those days where I had to run. I always hated forcing a run on an injured body. It was risky and I could re-injure myself which would set me back months, but when you’ve got post-traumatic stress knocking, you’ve just got to go take care of business. 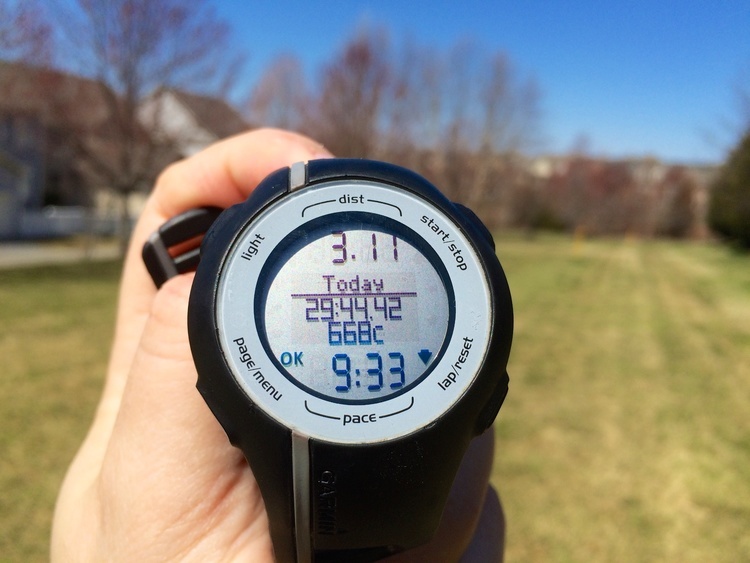 I might have gone a little above and beyond my normal self-protective 50/50 walk/jog limit that day, but I generally stuck with my program, and then had a genuine “HOLY SxxT!” moment when I looked down at my running watched as it beeped for the 5K and I saw a 32:52. I had never gone that fast before, ever. It was a new personal best! I hadn’t done any serious running in months and wasn’t at all conditioned up for it, and even when I was before I still couldn’t do better than 33 minutes without causing a nervous system crash. I was so worried that I nearly texted my wife a “crash warning”, when I knew I had overdone it and was going to be in trouble later, but I made it through the rest of the day just fine, and managed to get up the next morning under my own power, too. I was shocked. I thought it was a fluke and that maybe it was just the adrenaline from post-traumatic stress giving me a bit more of a tailwind than I had expected, but I hadn’t been that spooked. In the grand scheme of post-traumatic stress episodes, this ranked as merely a two or three on a ten scale, just a little blip. I had had far worse episodes of post-traumatic stress and gone a lot slower, and so I knew this couldn’t be correlating directly with amount of anxiety or adrenaline present. I went running again a few days after that 32:52 to see if it was a fluke or not, and managed an even better 32:25 without any anxiety fueling the run. On top of that, I noticed that it felt different to run now, too. I didn’t feel my whole body slipping into neutral and straining after a few blocks of running as I always had in the past. There was no longer a low-grade burning or straining sensation all over my body, but rather a more strictly muscular type fatigue just in my legs as I ran, which would be the more normal order of things. Something clearly was different now. Finally across the plateau and closing in! It was surreal. Almost out of nowhere, and after two years of pounding the pavement feeling like I was going nowhere so many times, I had just set a personal best 5K time for myself, yet felt like I was sandbagging and had so much more to give! I had no idea what was happening or what had changed, but it was an incredible feeling. Two days later, I decided to get serious and allowed myself to run freely, and without the self-protective restrictions I had placed on myself before. It’s good to push yourself every once in awhile just to see what you can do, and the tears started flowing when I saw a 30:24 at the 5K, with an overall pace of 9:48 minutes per mile. 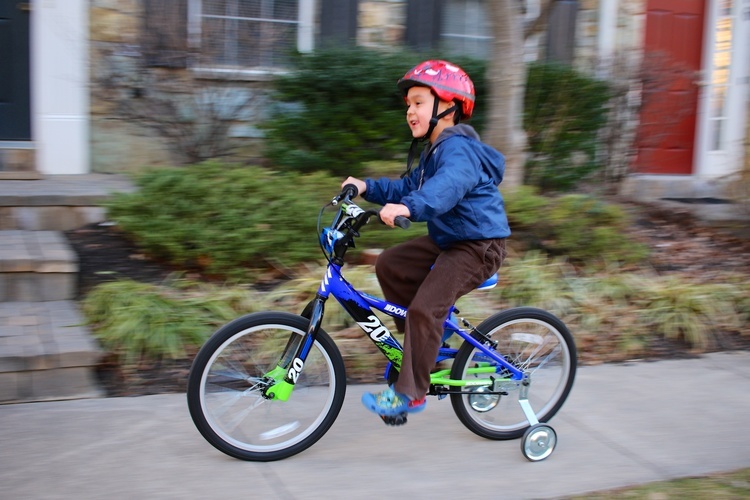 It was then that I finally realized that somewhere, somehow, I had rounded a huge corner, and that my body wasn’t nearly as limited anymore as it had been. I didn’t just reach but rather smashed right through my preliminary goal of being able to maintain a 10:00 minutes/mile pace. For the very first time, hitting a 5K in 30 minutes wasn’t just a fantasy and something to dream about being able to do someday far into the future. Now it actually felt real and achievable, and all I had to find was another 8 seconds per mile. The next run I went for a few days later, I wasn’t feeling it. I felt fatigued and couldn’t run through the first mile, and decided to back off and “only” ran a 33:14. This was still a time that would have absolutely flattened me just two years ago, but now it was a “slow” time for me. I didn’t allow myself to feel even the least bit discouraged, and simply kept at it. My, how far I’d come! 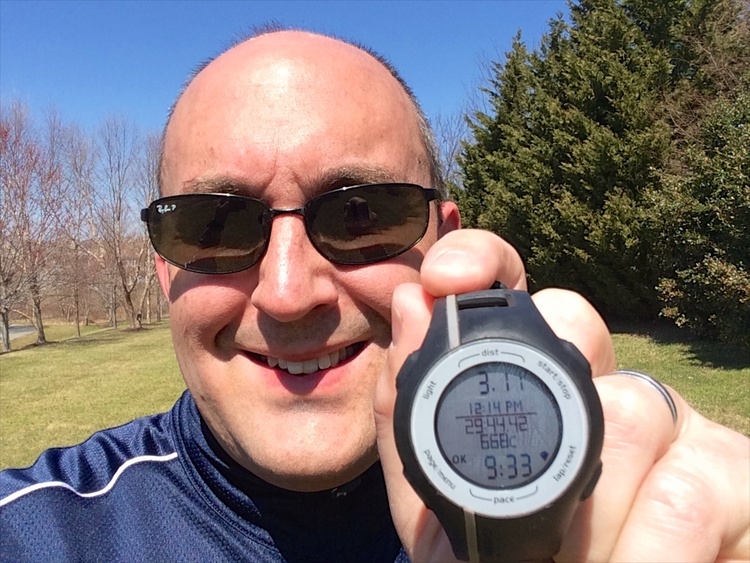 On Monday, March 30th I went out and ran a 30:57, a 9:58 overall pace which I was happy with. It wasn’t a PB, but I knew I was headed in the right direction and just kept my head down. It had taken me two years to cross this seemingly impossible plateau, with muscle fatigue and nervous system issues fighting me at every step. For all I knew it might take me another two years to cross the next one, but all I needed to feel was that it was within reach, and just kept running. Two days later on April 1st, 2015, April Fool’s Day of all the days and the start of Testicular Cancer Awareness Month, I just felt good. I had built my body up a bit with these previous few runs, but my family and I were headed off for a week long spring break adventure the following week. This was going to be my last opportunity to get a run in for over a week, and there was no way in hell I was going to lose the momentum I had built up without trying to make this happen. I wanted it so bad that I wasn’t just tasting it, I could smell it too. It was a picture perfect early spring day, and if ever there was a day where all of my biorhythms or whatever you want to call them were all in peak alignment, this was the day. I felt good and well-rested, hadn’t had hardly any of my usual fatigue in the morning, and just felt primed to make this happen. As I stretched and set off on my run, everything felt good. None of the body slipping into neutral nonsense down the first damned block, no muscle or other fatigue, and I just felt like I was in the groove. I ran through the first mile, listening very carefully to what my body was telling me, and it told me to just keep on going! As I crossed through to the second mile, the thoughts started flowing. All of that classic motherly advice came back, that if you put your mind to it you can accomplish anything. For the longest time, my mind had been the only willing participant in my running endeavors! I remembered Stuart Scott writing and speaking so much about about Coach “Jimmy V” and his famous speech at the 1993 ESPY awards, and to “Never Give Up, Don’t Ever Give Up!” You can call me a lot of things, but a quitter isn’t one of them! As I crossed into the third mile, I recalled how Lance Armstrong wrote that his final few tour stages almost felt effortless as he was closing in on his first Tour de France victory after his cancer fight. Unless you’ve been living under a rock you know that Lance was juicing, but so was everybody else at his level. I wasn’t, but here I was running further and faster than I ever had before, and it was almost feeling effortless! I took only three very brief walking breaks of 20-30 yards tops on this run, and only on particularly tight sections of my course that would almost slow me down to a walk anyways, and then got right back into a run. I needed to maintain at least a 9:40 pace to hit the 5K in 30 minutes. As I rounded the last tight corner and broke into a run, headed towards my finish line a quarter mile away, my eyes lit up when I saw a 9:38 pace still on my watch! I knew I had done it, and wouldn’t even need to sprint the last quarter. I had it in the bag! I could just coast myself in, and the only thing I needed to do was not trip or get hit by a car! Down this final stretch of road, the tears started flowing at full force. All of the memories of so much pain and frustration with my body, and all of the misery started releasing themselves. Every single day for the past four years I had felt like an old man, tired and fatigued, and struggling to get through each day. I was always happy to be alive, but it had always felt like I was dragging heavy chains around that were slowing me down, and holding me back from living my life to its full potential. After two years of pushing so hard, I was finally busting through these chains! All of the days I was so frustrated and hurting, all of the days that I just wanted to quit and say to hell with it all when I felt like I was getting nowhere, and all of the sacrifices I had made, this bittersweet moment made it all worth it. As the 5K passed and my watch beeped, I managed a 29:44 at a 9:33 pace! Victory at last! I crashed through my goal with more than a few seconds to spare, and I was over the moon. A bittersweet victory at long last, smashing right through the 30 minute mark on a picture perfect early spring day! I laughed, I cried, and I reflected, just soaking in every second of this great moment after struggling so much for so many years! Unlike the past where big moments came and went without really registering, I took time to soak this all in. 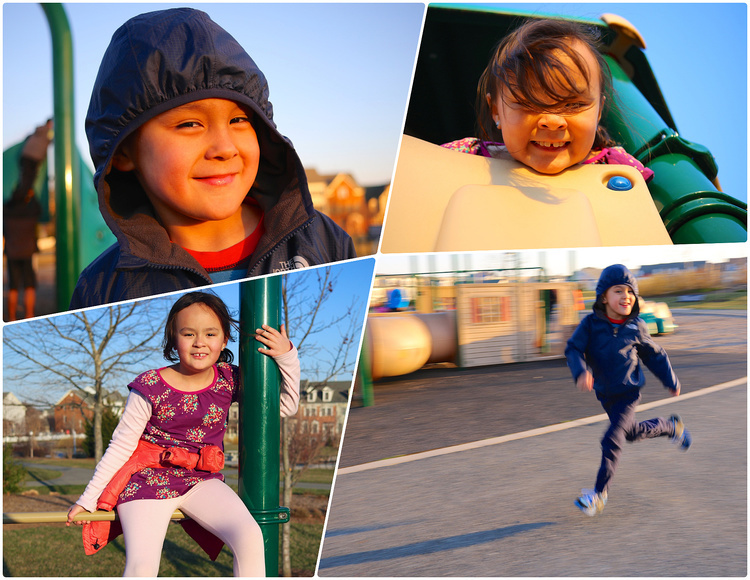 Rather than rushing to the next appointment or task, I relished every moment of this. I sat, I laughed, I cried, and I reflected. I took selfies and sent messages to a few select friends who knew of my struggles, and who I knew would be able to share in my joy of this great personal victory. I didn’t feel like an old man anymore. I felt 20 years younger than I had been. I felt like someone that had been told they’d never be able to walk again, and after years of trying finally proved everyone wrong. And even better, I made it through the rest of my day just fine, chased my kids around at the park and on their bikes that night, and still managed to get up under my own power at six-thirty the next morning. My dedication to running had become my fountain of youth that helped me turn back the clock. Running had not only been key to getting my mind back, it had finally helped me get my body back as well. Never Give Up, and Never Stop Believing in Yourself – The same attitude that’s seen me through so much emotional trauma and turmoil is the same attitude that’s seeing me through my physical challenges as well. Never give up, and never stop believing in yourself! I had to change course numerous times dealing with mental health issues, and the same has been true in dealing with my physical challenges. I’ve failed numerous times and ran my body straight into the ground, but I never quit! I kept getting back up again, and kept trying different things until I finally found a way to exercise that gave me all of the benefits I needed, but wouldn’t run me into the ground. Patience and Persistence – I learned to be patient with my body, and also forgiving. I learned that it wasn’t fair to compare myself to friends who hadn’t even had cancer, weren’t dealing with hormonal swings, and who hadn’t been through chemotherapy and experienced all of the nerve damage that I had. Rather than obsessing over what I couldn’t do, I learned to appreciate and accept what I could, and simply kept at it when I found the right balance of what I could do without breaking myself. Numerous times and over and over again my body told me no, but I persisted with my running and was relentless. There’s only one time that I actually ended up curling myself into a ball in my bed instead of going running, because I just felt so awful that day. Not only did I feel terribly guilty, but I didn’t get any of the benefit of running that I always did after a run, and vowed to never fail myself like that I again. The Resiliency of our Bodies – As I pounded the pavement month after month, little did I know that my body really was responding to what I was putting it through. Little by little, and at a rate far too gradual to ever notice, my body was improving and slowly but surely coming back to me. Maybe it would have made some of this recovery on its own, but the benefits of running and exercise are very well known. I don’t think there’s too many out there that would argue that all of this exercise hasn’t helped to encourage and accelerate such a wonderful physical comeback! Never underestimate our bodies ability to heal and improve themselves, even long after doctors say the window for healing has closed! The Importance of Priorities – If you’re told that you’re at high risk for a heart attack or some other life-threatening condition unless you start exercising and make other lifestyle changes, I think most people will suddenly find the time that they never had for exercise, out of fear of death. In my case, my body just wasn’t coming back to life like I had expected it would, and I wanted so badly to not just live, but to live without pain! My family is no different than any other busy, two-professional, two-child household, with work schedules to manage, rigid kid drop off and pickup times, and zillions of after school and weekend activities. It mattered not. I just had to make the time. I could barely get my body moving in the mornings, and by the evening it was already on a solid downward slope. As much as I had enjoyed going out to lunch with my new co-workers almost everyday, and as supportive as many of them had been, I had to give that up. My lunch hour was the only time of the day when I could get a good solid workout in, with that boost and all of the other benefits that I needed. Never hesitate to do what you feel you need to do for yourself after cancer. Self-care and self-preservation should be the top priority. As the saying goes, you can’t love and care for others until you can love and care for yourself. Making self-care my top priority in life helped me to heal both physically and mentally, and in turn allowed me to once again be the husband that my wife loved and needed so much, and the father that my children needed likewise. Now I can be “that dad”, jogging through the neighborhood and trailing behind his kids as they ride their bikes. I took this photo after running a 5K over lunch that day at a pace would have flattened me in years past, and still had the stamina to be active with my kids that evening! The power of exercise! I used to think that runners were crazy, and wondered what on Earth drove them to want to torture themselves the way they do, pounding the pavement week after week. Even the well known satirical website The Onion parodied this in one of their brilliant video skits, but I get it now. I so get it. When you’re fighting cancer, you always have a ton of appointments to get to, and medical professionals become a big part of your support network early on. The stress and anxiety during a cancer fight doesn’t let up once you’re on surveillance, though. It only gets worse, yet you lose all of the active support from the medical system that these appointments provide while actively fighting. Running became appointments that I had with myself, to help rehabilitate my body, relieve stress and anxiety, and to soothe my soul. My running time has become sacred to me, it’s been that good of an outlet, and now it’s just hard-coded into my schedule. Taking up running is the single best thing that I ever did for myself after cancer. 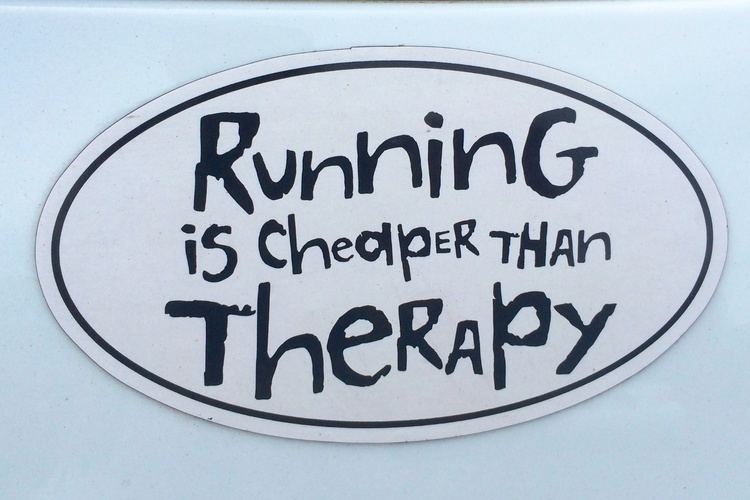 A fitting bumper sticker that I saw on a parked car as I was wrapping up this essay, along with a pair of 13.1 and 26.2 stickers. I couldn’t agree more! Who knows what’s next for me, but I know that as far as I’ve come and as hard as I’ve been willing to keep pushing myself, that anything is possible! Special thanks to all of my runner friends, but especially to my friend and two-time testicular cancer survivor Alex Hohmann. Not once was I ever made to feel even the slightest bit discouraged by any of my runner friends, but Alex especially was such a great source of encouragement, guidance, and moral support, in addition to just plain being an exceptional human being and role model. Alex has been a wonderful mentor, and is one who leads by example. The world needs more people like Alex. I actually bought my trusty Garmin Forerunner 110 GPS running watch off of Alex when I was just getting going, and he was upgrading to something fancier. Thanks to all of the support I received from Alex and all of my runner friends, and a whole lot of blood, sweat, tears, and dedication on my end, now I finally feel worthy of wearing it! Download and use for free! Start beating fatigue today. Download and use for free! This project has received funding from the European Union’s Horizon 2020 research and innovation programme under grant agreement No. 756641.